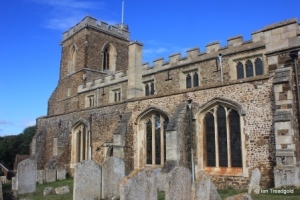 The church of St Mary the Virgin in Potton is situated to the east of the town on the road from Potton to Cockayne Hatley. 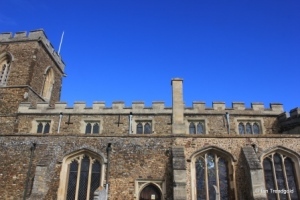 There is parking available on the forecourt of the church hall opposite. 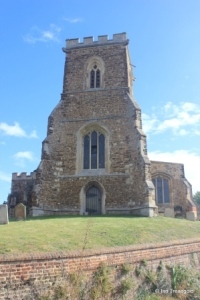 The church is situated high above the road making it visible for some distance to the south. 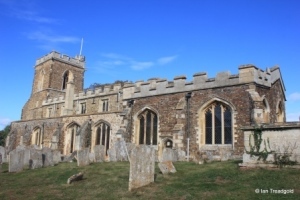 The church consists of a nave and chancel with north and south aisles, a chapel at the east end of the south aisle which is now used as a sacristy, a north transept, west tower and a double entry north porch. The nave and chancel are some 95 feet in length. 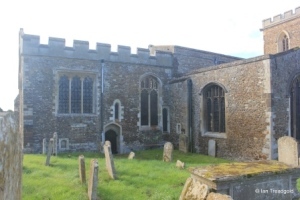 The nave is around 20 feet wide, the chancel around 15 feet wide and the south chapel 12 feet wide. The north aisle is around 11 feet wide with the south aisle being about 10 feet wide. The north transept is around 22 feet by 13 feet and the west tower some 13 feet square. 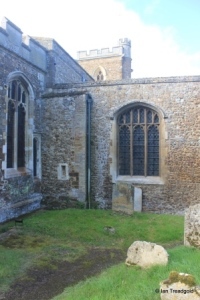 The origins of the church date from that late C11 but no part of the present building is older than C13 which is date from parts of the chancel and north transept. 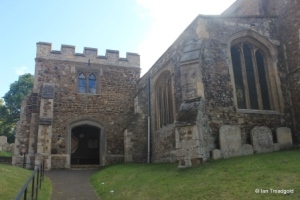 The north aisle was widened in C14 with the tower and the north porch being added in C14. 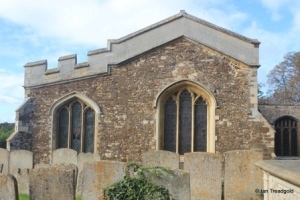 The south-east chapel is the latest addition to the exterior design of the church and dates form early C16. 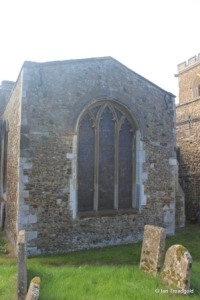 A vestry to the north side of the chancel dated from C15 but this was demolished in C16. 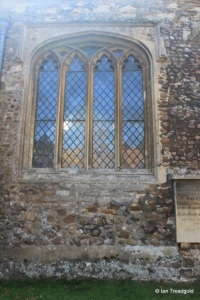 The south side of the church has two windows on the south side of the chapel and three on the aisle. 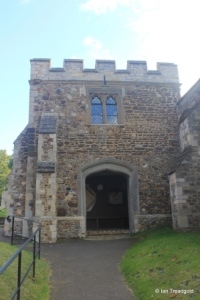 There are doors to both chapel and aisle. 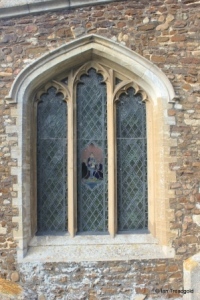 The two south facing windows of the chapel are of similar style being of three cinquefoiled lights under four-centred arches surrounding a priest’s door. 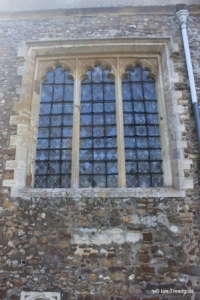 The door and windows are all fully restored in recent times. The three south facing windows and the west window of the south aisle are slightly smaller in height than those in the chapel but are of the same style with a more flattened four-centred arch. 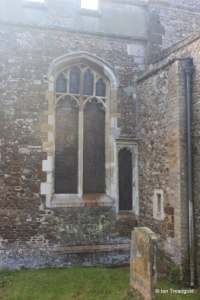 There is also a south door to the west of the central window. 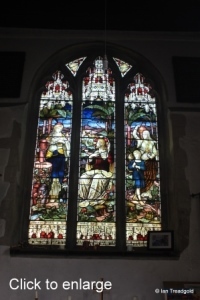 The eastern window of the three has glass panes depicting the nativity, crucifixion and resurrection with Christ and St Mary Magdalene in the garden of Gethsemany. 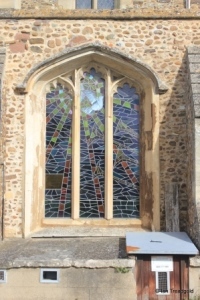 It was placed in memory of the Rev George Bidwell by his daughters on his death in 1865. 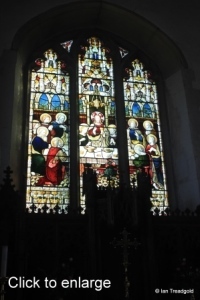 Whilst George Bidwell was not rector of Potton (he was Rector of Stanton in Suffol), a Woodward Clarke Bidwell was vicar of Potton at that time so clearly there were family connections. 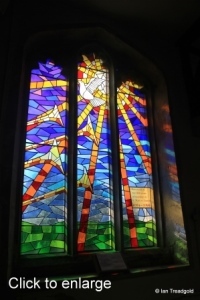 The glass in the central window of the south aisle was inserted in 1994 to commemorate 900 years of worship in Potton church. 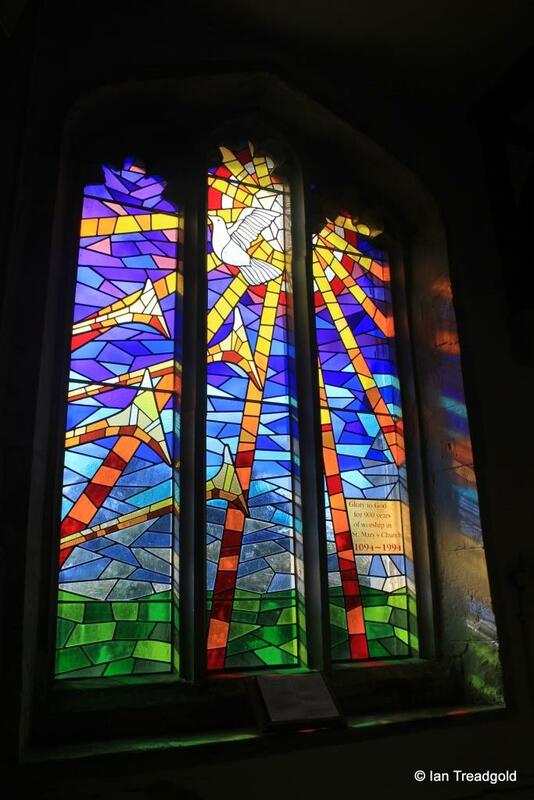 Designed by Carl Russell it depicts a dove representing the Holy Spirit radiating from the sun heralded by angel’s trumpets. The clerestory above the nave has five windows, four of two lights and a third of three lights, all under square heads. 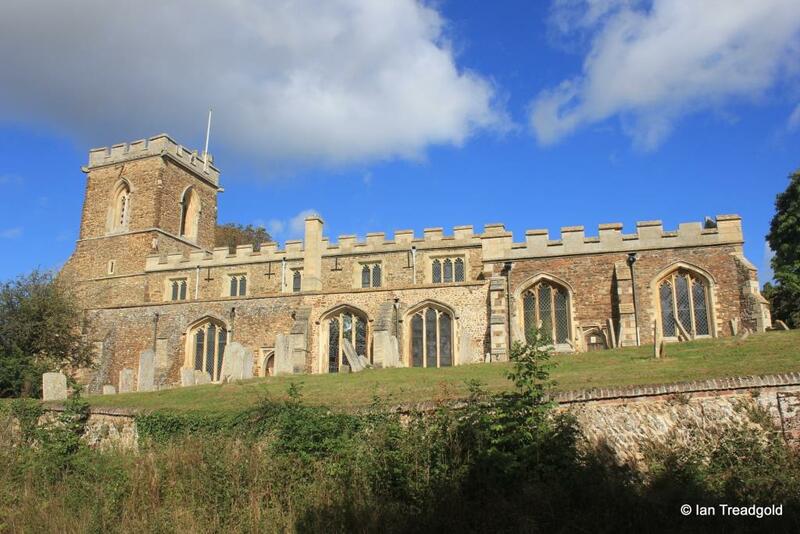 The clerestory, tower, porch, chancel and chapel are all embattled but the aisles and north transept are not. 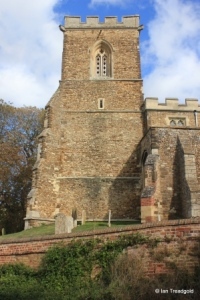 The tower is of four stages with diagonal buttresses to the western corners and an internally accessed round stair turret in the north-eastern corner. The north side has the remnants of a stone lamp holder on the second stage about 12 feet from the ground. The belfry windows are all of two trefoiled lights with quatrefoil tracery above and wooden panels in the lights. 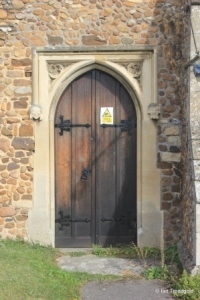 The west doorway is modern and the door itself is blocked. 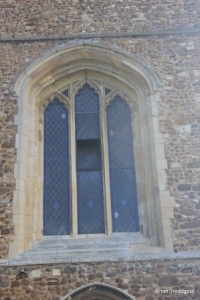 The west window in the second stage of the tower is of three cinquefoiled lights under a four-centred arch. The north side of the church is a complex arrangement of windows and buildings that form no consistent façade. 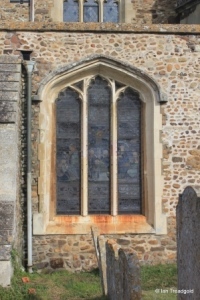 To the west of the porch, the north aisle has a west window and two windows on the north side. 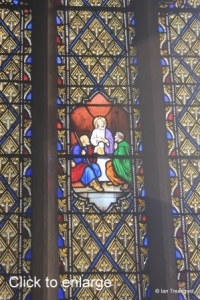 The west window is of three lights, the western of the north facing windows has four lights and its companion two lights. All have been restored in recent times and are under four centred arches. The four light window arch is very flattened and surmounted by a square hood mould. 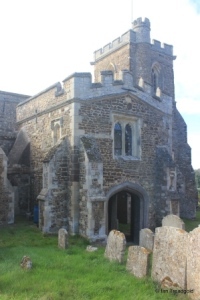 The north porch is unusual in having entrances to the west and north and Is quite heavily buttressed for such a relatively small part of the church. 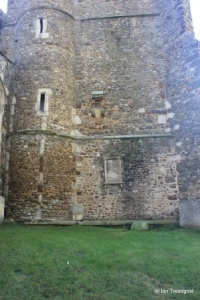 There is a parvise above accessible from within the porch enclosure with windows to the west and north over the entrances. 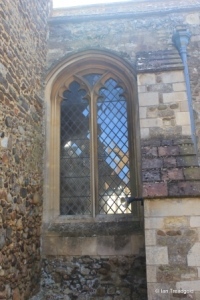 There is a blocked window in the upper level to the east of the porch. 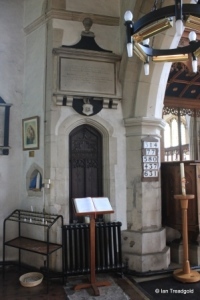 The interior of the porch has been restored in recent times. To the east of the porch the architecture gets confusing. 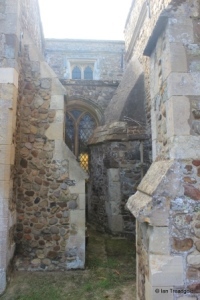 Between the porch and the north transept, the aisle wall is visible with a two light window squashed between the parvise stair and buttress to the north transept. 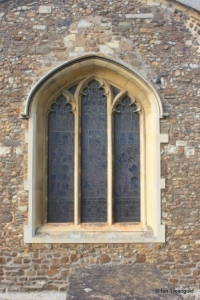 The east window of the transept is of three lights with perpendicular tracery above under a four-centred arch. 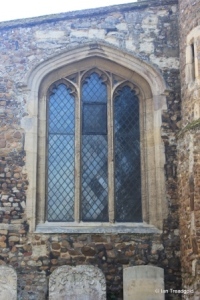 The rood stair is visible to the left of the window with a small blocked window low down. 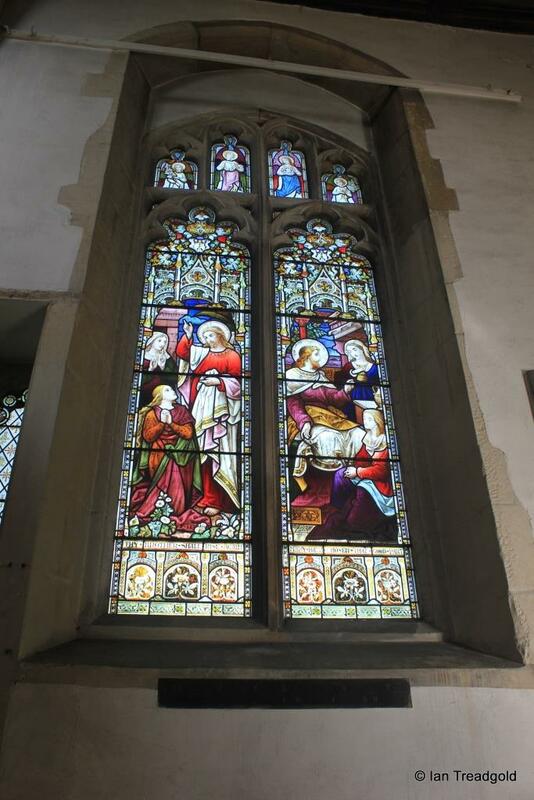 The north side of the chancel is a complex affair of windows and doors of differing styles. 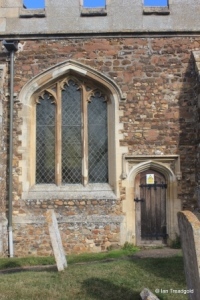 It is easier to understand if the long removed vestry is imagined in place under the eastern window and absorbing the doorway and blocking the small lancet above. 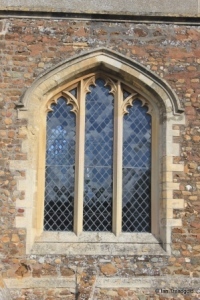 The western pair of windows date from C15 with a tall two light cinquefoiled window with perpendicular tracery above under a four centred arch and a lower single lancet window in the angle with the transept. 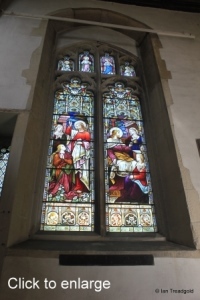 The larger window contains images of Christ along with bible quotations “Thy brother shall rise again” John 11:23 and “Mary hath chosen that good part” Luke 10:42. 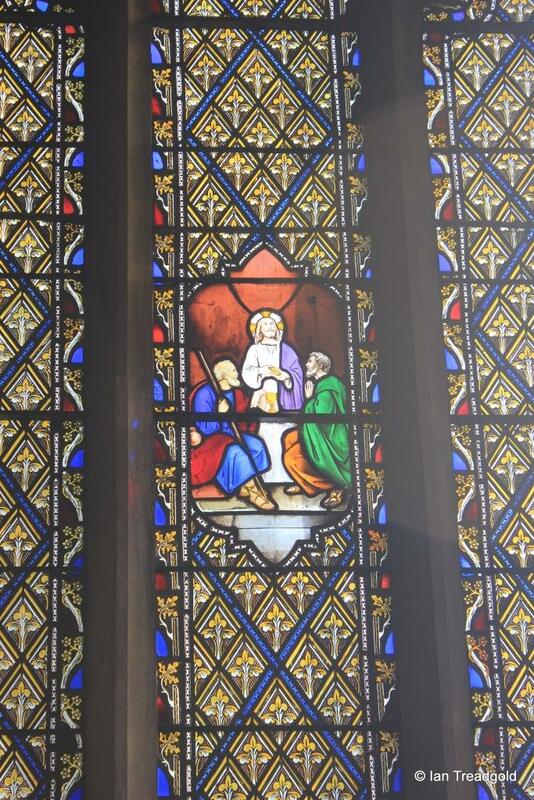 The glass in the window was given by the widow of Revd Woodward Clarke Bidwell. Revd Bidwell was vicar from 1845 to 1876. 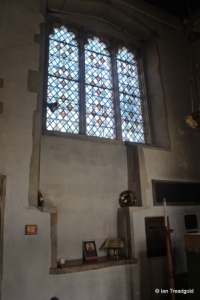 The eastern window of the north side of the chancel is of three cinquefoiled lights under a square head. Inside the sill was cut down to form a shelf when the vestry was behind this wall. 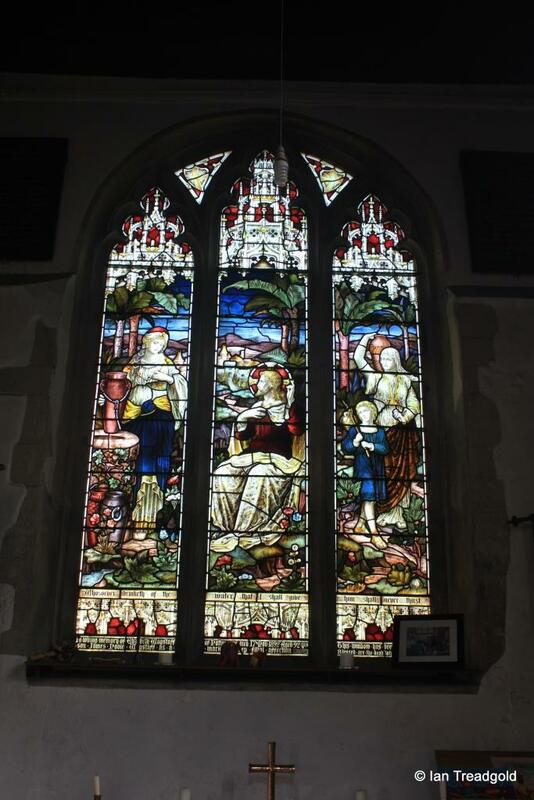 The east end of the church covers the east window of the chancel and that of the south chapel. 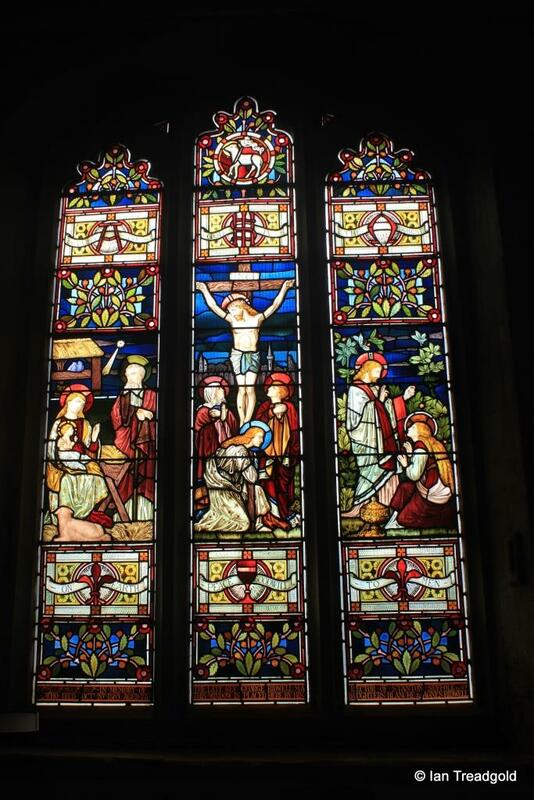 The main east window is of three cinquefoiled lights and depicts the last supper. 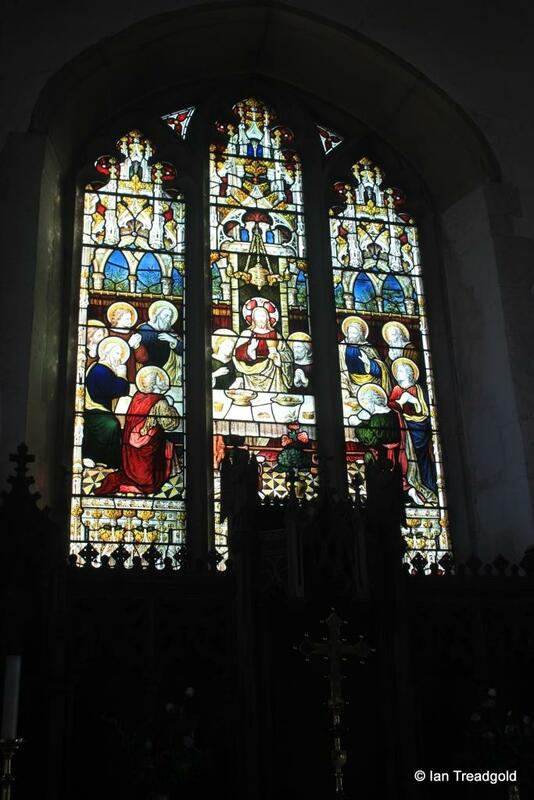 The glass was given in 1888 in memory of James Wagstaff by his son, also James. 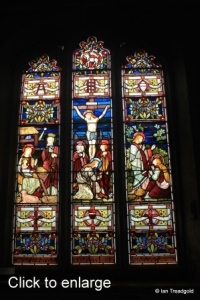 The east window of the south chapel is also of three cinquefoiled lights and contains amongst more general stained glass a panel depicting Jesus breaking bread with his disciples on the road to Emmaus.